Who doesn’t aspire to a life of luxury? If jewels, watches, cars, wine and fashion don’t appeal to you, check if you still have a pulse! 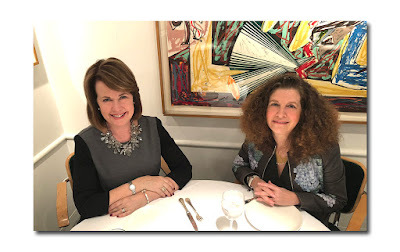 I suggest you hightail it to Sotheby’s where I spent Friday evening and all day Saturday taking in the various sale exhibitions before they go on the block beginning Monday night. I toured the "Magnificent and Fine Jewelry" sales, the watches, the cars (yes, the entire 10th floor is currently a rare car museum!) and even sampled the wines. #BestDayEver! 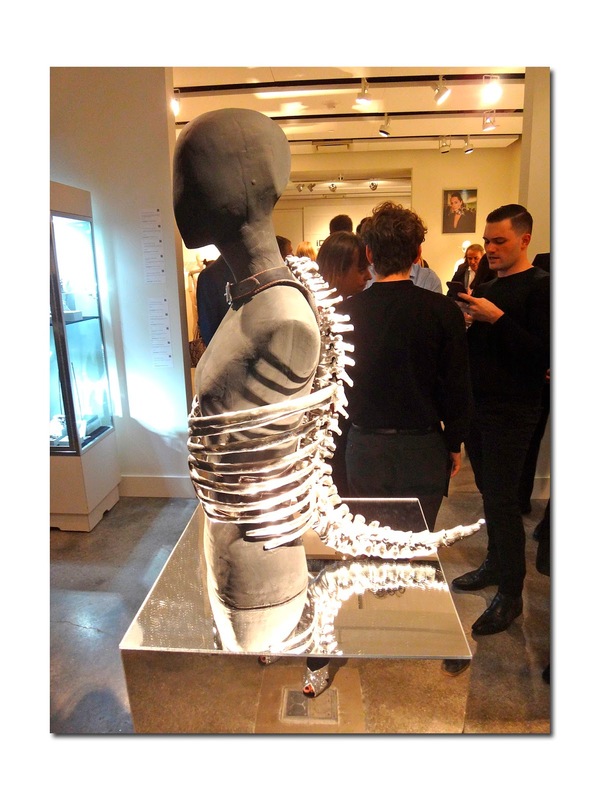 However, if you are a fashion person, please run, don’t walk, to the "Couture Fashion Jewelry Exhibition" of The Personal Archive of Shaun Leane before the sale tomorrow evening. Leane is a remarkable jeweler who had a two decade long friendship and collaboration with Alexander McQueen and is the mastermind behind the incredible pieces which walked the runways and were seen at The Met Museum exhibition (2011) and Victoria and Albert Museum (2015) of Alexander McQueen: "Savage Beauty". “These pieces are historically incredibly important,” said Kerry Taylor, Head of Sales at Kerry Taylor Auctions, (famous for the sale of the Victor Edelstein blue velvet gown Princess Di wore to dance at the White House with John Travolta). Ms. Taylor is running the Shaun Leane sale in conjunction with Sotheby’s. 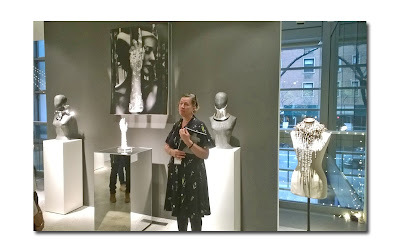 She introduced a Friday night talk with the jeweler saying what I was thinking -- that it’s a thrill to be able to see and touch these things which were made for the catwalk, and are irreplaceable one-offs. 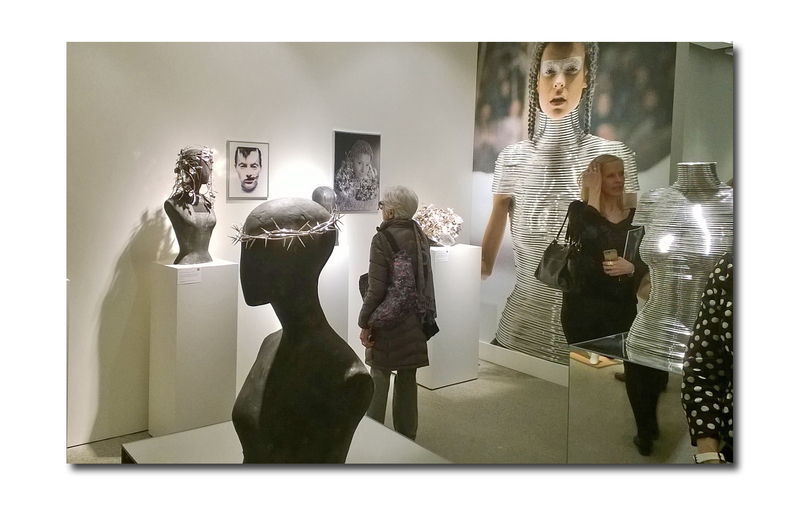 These pieces intersect the space between art, jewelry and sculpture – in fact several of the larger pieces are to be sold along with the specially designed mannequin busts. 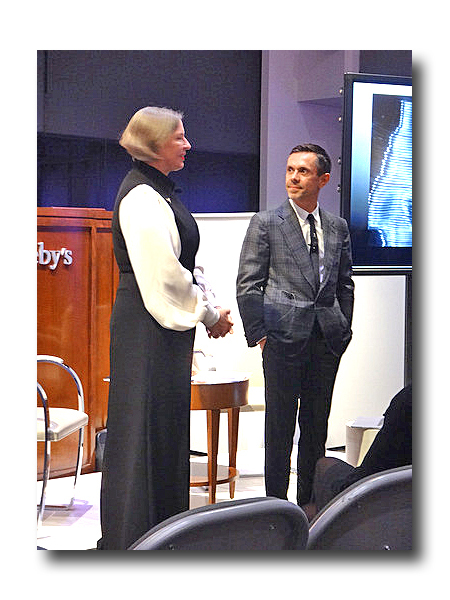 The sprightly Leane spoke about his youth, his becoming friends with “Lee,” and his classical training as a heritage goldsmith who worked on diamond tiaras for the royals by day and on skeleton corsets for McQueen’s own line and for Givenchy when McQueen was design director, by night. “I was a rebellious child but very creative,” he began. At 15 years old he left school for a seven year apprenticeship which he thought he’d only stick around for a year but ended up completing at the ripe old age of 22. At the age of 18 he was creating jewelry and tiaras for Asprey and Garrard as well as restoring antique Victorian jewelry. He noticed while working with older classical pieces that if you just changed a line here or there the pieces became quite modern, spurring on an itch to design. “When I met Lee we were the same age (22). We clicked – we had similar working class upbringings and were now part of the London fashion revolution. He was on Savile Row and I was in Hatton Garden (the upscale British jeweler’s row). Here the journey began with Lee taking Shaun out of his comfort zone. “He gave me a platform, a total freedom of creativity,”—however instead of working in fine materials they could only afford to work in brass, silver and aluminum. Leane balked at first but quickly became intrigued each time McQueen came up with an idea (often in the pub that they frequented). 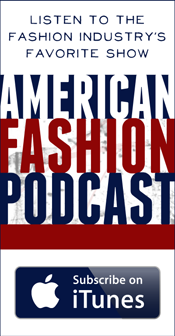 It was a new and bigger challenge each time beginning with Spring/Summer 1996’s animalistic show for which Leane created the silver “elephant tusk” earring. “There was a powerful meaning to everything we did,” Leane explained. 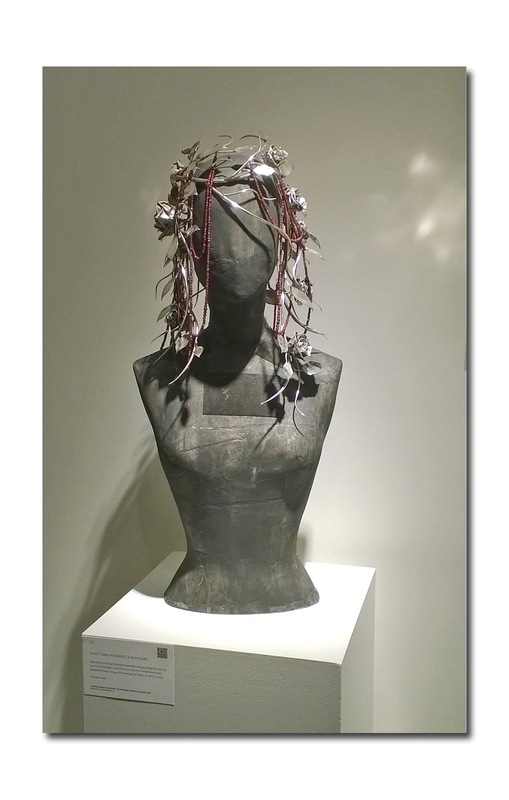 Next he created the silver crown of thorns for the Autumn/Winter 96-97 “Dante” collection as well as the silver thorn arm-vine and earring. Leane experimented with large resin molds, castings and the use of larger tools for McQueen’s concept of bringing that which is inside the body to the outside. His Spring/Summer 1998 “Untitled” collection introduced the Male and Female Jaw-Piece worn outside the jawbone as well as the piece that signified that there were truly “no limits, no boundaries,” the Skeleton Corset. “This piece meant nothing was impossible,” said Leane who said he couldn’t sleep until he figured out how he would execute this vision. 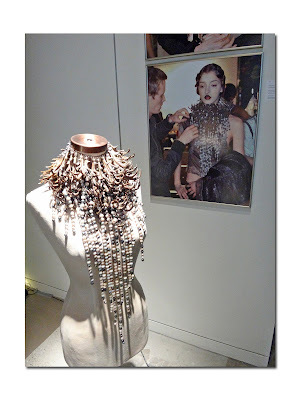 The 1997 Burmese Coiled Neckpiece was worn several times over the years on the runway and also by Bjork on her album cover. Like many of the other pieces they created together it symbolized a strong warrior princess and had an armor-like appeal. Many were met with derision and were thought to symbolize oppression of women when the exact opposite was true – they were meant to evoke empowerment. McQueen was so obsessed with his “It’s a Jungle Out There” neck coil that he challenged Leane in 1999 to create a coiled corset. 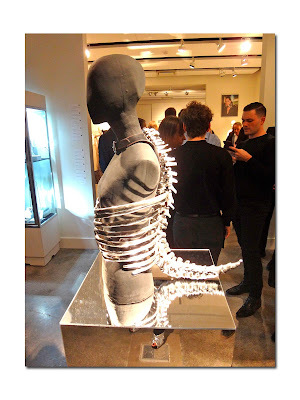 “We were in the same pub as when he came up with the skeleton corset,” remarked Leane. “That pub had an energy about it.” (Or perhaps very strong drinks!) At this point, Leane was still making tiaras by day and living in his workshop around the clock to make the coiled corset. “It was a formidable structure, like armor. When we created something hard it also had something soft about it,” he said referring to the curves of the body it followed. 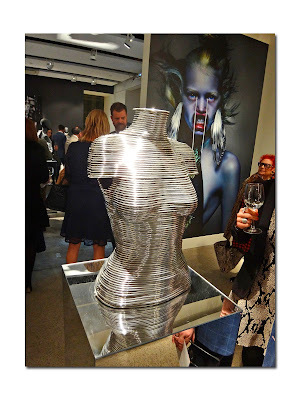 This piece was so loved that it became the only one that both McQueen and Leane signed. 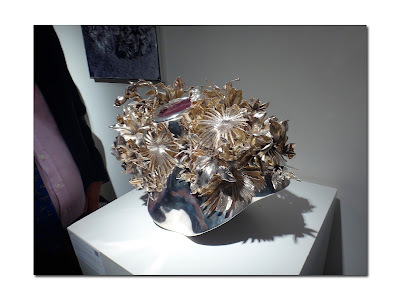 In 2004-5 for “Pantheon Ad Lucem” (Towards the Light), Leane created the Orchid Shoulder-Piece – an electro-formed silver, molded shoulder plate in two sections, entirely covered with three-dimensional exotic blooms and foliage, which sat inside the collar of a specially made gown. For Isabella Blow, Leane designed a Silver Tusk Anklet – inspired by her suggestion of wanting ankle jewelry originally worn by turn of the century prostitutes. This became his first commissioned piece for The House of Shaun Leane. Once again this design had the signature beautiful, fierce, fearless and protective aesthetic that he was known for. 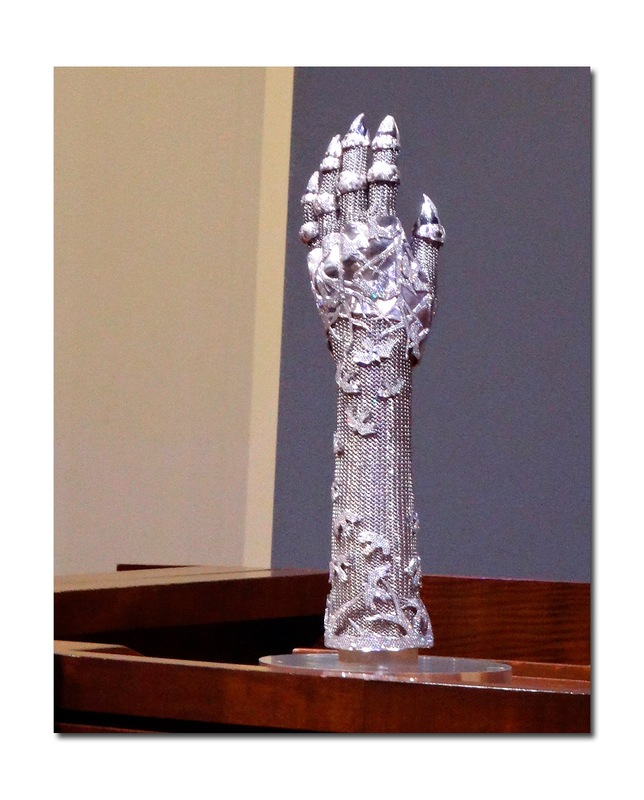 The final piece de resistance (and the one that accompanied him at the talk) is the Contra Mundum (Against the World) White Gold and Diamond Evening Glove which he created for Daphne Guinness in 2010. At this point he had been designing with McQueen for 17 years – “we pushed boundaries – no one had ever made a diamond evening glove.” The glove, inspired by Guinness’s comment that she needed protection from a mob which surrounded her, Leane and McQueen at a crowded exhibition at the Victoria & Albert Museum, took four and a half years to make, 17 craftsman and 21 separate fittings. “It was a labor of love,” said Leane. Sadly, after both McQueen and Blow passed away, Guinness said they should make it in gold and set each finger tip in diamonds instead of just one. Each link of chain mail is hand crafted and the hand detaches from the arm so that it can be worn as a cuff bracelet. As for whether Shaun Leane is sad to see his collection up for auction, he is not. “The collection is bigger than me – I shouldn’t own it.” However, these pieces have stood the test of time: “They have the same energy as when I created them in the ‘90s.” What about the idea that these pieces are dark and macabre? “Lee and I always thought that you find beauty in the ugliest of places. There’s always an edge.” As for his future projects? “I have a fine jewelry house on Bond Street. I still create tiaras. Lee took me out of the box. I want to apply my skill to as many different mediums as possible – rules are there to be broken.” Next he will dabble in architecture as he’s been hired to design a facade of a building in bronze. “This will be the largest public sculpture in the UK – people will be walking by and I don’t want to impale them,” so maybe he will go easy on his signature spiky protrusions. If you visit the exhibition, don’t be surprised to encounter Shaun himself. He was there on Saturday when I revisited the space much in the way he says he liked to hang out at the V&A’s "Savage Beauty Exhibition" to hear the reaction that his pieces evoked. While his aim was to provoke and inspire, he was not above talking to those who mused aloud over his creations, no doubt delighting lucky show-goers both then and now.